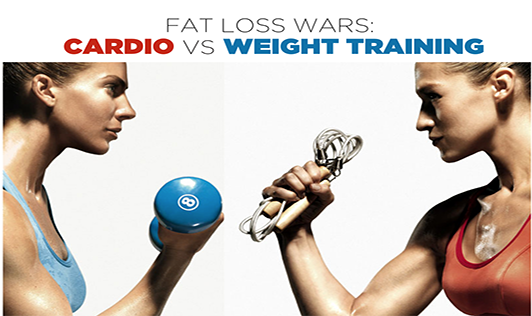 When it comes to fat loss, most people embark on a program of cardio and dieting. Strength training is merely an afterthought. Plus there are a lot of myths surrounding strength training and weight loss. In fact strength training could end up burning just as much if not more fat than cardio. Then why is it that most people looking at losing weight rely only on cardio alone? Cardio gives quick results and shrinks down both your muscle and fat; where as with weight training you may end up piling on a kilo or two due to the muscle mass you are building. Little do people realise that it is this muscle mass that improves your metabolism and helps you lose weight. With weight training you retain or build muscle while burning off fat. Strength training coupled with diet and cardio burns fat far more than the combination of cardio and diet alone. One thing that should be mentioned at this point is that many women will shy away from lifting weights, particularly going heavier (more than 5-10 kilograms) simply because they believe that doing so may give them a masculine look.This is an unfortunate misperception, because the fact of the matter is that females do not have enough testosterone in their body to develop this degree of musculature naturally. If you do cardio training for about 60 to 90 minutes, you could burn somewhere around 500 to 800 calories, depending on the exact length and intensity level. That is a fairly decent number and will definitely help with your fat loss goals. But, keep in mind here again that you are going to have to keep doing those long cardio sessions. Time will likely become a big factor with this one. Boredom could start to play a role over time as well. It is therefore good to break free from thinking that cardio equates to fat loss and weight training equates to building muscle and weight gain. It's simply not as clear cut as that and often the biggest difference between fat loss and muscle building is more related to diet than anything.